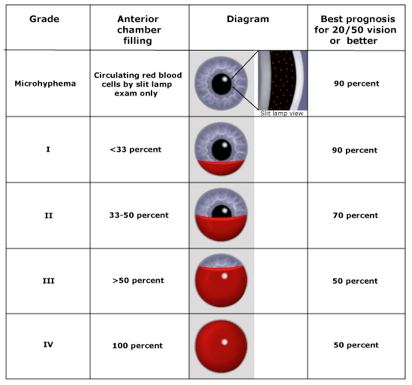 A hyphema is a collection of blood in the anterior chamber and is usually the result of trauma. The eyeball is compressed, and the anterior ciliary body tears, leading to bleeding. Generally hyphemas are managed conservatively with close follow-up. The success of treatment, as judged by the recovery of visual acuity, is good in approximately 75% of patients. Treat with rest, unilateral patch/shield, acetaminophen (but not ibuprofen), and elevating the head of the bed. Other therapies are controversial, and are at the discretion of the Ophthalmologist.